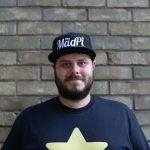 Hi, Rob from The MagPi here! Issue 51 is out and just in case you weren’t sold on it already, here’s a little something to tempt you. 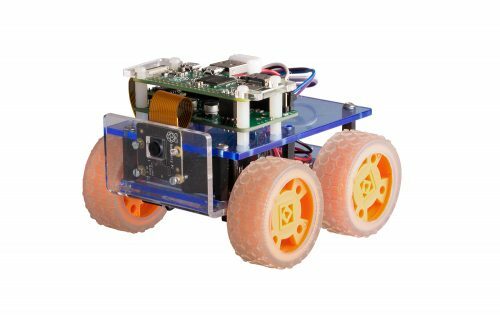 Over the past few years, Raspberry Pi robotics has really come into its own, taking strides to make building robots just that little bit more fun and accessible. This month in The MagPi, we’ve decided to take all these advances and use them to create an incredible little robot. There’s lots more to enjoy, including reviews, columns, and a series of spooky and simple Halloween projects. Want to make sure you never miss an issue? Subscribe today and get a Pi Zero bundle featuring the new, camera-enabled Pi Zero, together with a cable bundle that includes the camera adapter. Free Pi Zeros and posters: what’s not to love about a MagPi subscription? 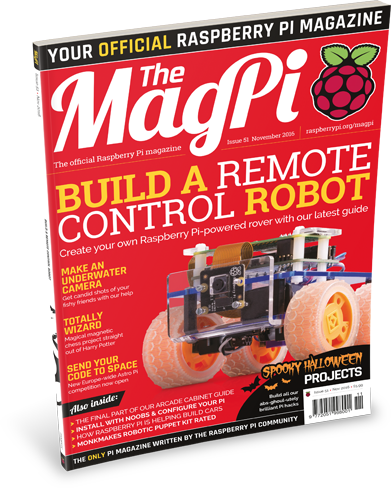 As always, you can download your copy of The MagPi completely free. Grab it straight from the issue page for The MagPi 51. Cool I’m 11 and ive always wanted to make a RsPi bot! I’m impressed by the Pi Camera on the robot on the cover. It stands out like 3d in a certain light. I thought my subscription copy had a free camera attached! Brand-new special Educator's Edition of The MagPi launched, packed full of inspiration! Learn C in our brand new MagPi Essentials book!